Right route: Is the drug appropriate for IVP administration? Right dose: Is the dose appropriate for IVP administration? 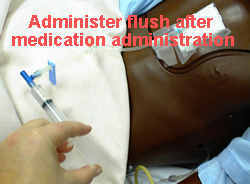 Not all medications can be administered IV push. Factors that prevent using IV push for administering a medication include stability, pH, concentration, and potential adverse reactions. Phlebitis: high concentrations of acidic drugs are more likely to cause phlebitis since they irritate the lining of the vein wall. Speed shock: a systemic reaction from a drug reaching toxic levels because of too rapid administration. Symptoms of speed shock are headache, syncope, flushing, tightness in the chest, and irregular pulse. The patient can progress to shock and cardiac arrest. Venous spasm: cramping of the vein may be caused by the chemical make-up of the medication, pressure from a too small gauge needle, or the medication solution being cold. Symptoms are cramping and pain above the IV site. 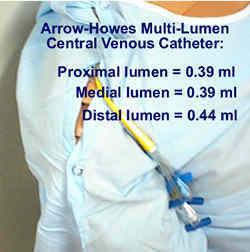 Infiltration: may be caused by injecting the medication or flush too fast causing distention of the vein wall, which may cause extravasation. The usual information - action, dose, side effects, reason that the patient is receiving the medication, route, etc. Does the medication need to be diluted? If yes, what can it be diluted with and how much? If the patient is receiving a maintenance IV solution, are the IVP medication and IV solution compatible? 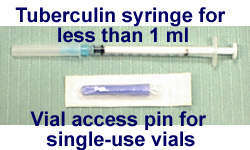 Gather equipment: Medication, vial access pin, diluting solution if needed, syringes (size needed for accurately measuring the medication and size needed for administration if dilution needed), flush solutions if needed. You need to be aware of the volume of the tubing from where the medication is injected until it would actually reach the patient. 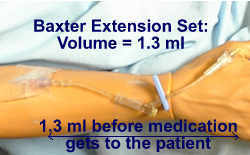 In this example, with the Baxter extension site, you can administer 1.3 ml before the medication will reach the patient. 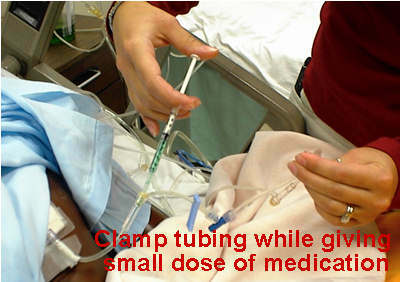 Since less than 1 ml is being given, all of the medication will be in the extension tubing! 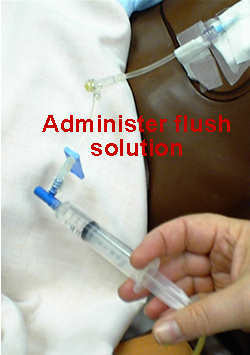 NOTE: You must administer the same amount of flush solution as the tubing holds at the same rate as the medication is to be given. 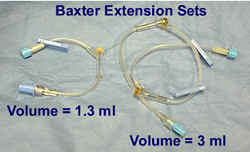 In this situation, since this Baxter extension set contains 1.3 ml, all the medication is in the tubing - NONE has reached the patient yet. 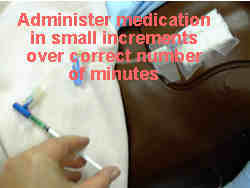 Give 1.3 ml of flush solution at the rate the medication is to be given, then give the rest of the flush.